WoW Patch 8.2 content revealed! 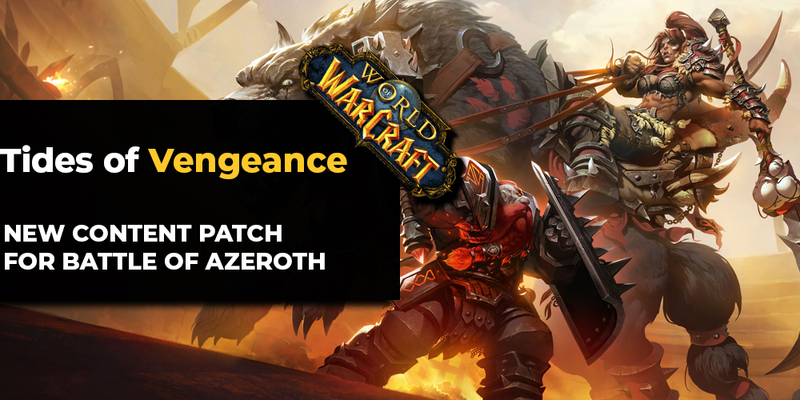 Blizzard concluded their preview stream of WoW patch 8.2 and announced that it’s going to hit PTR next week! Some of the new features have been shown in action, some ambiguities have been cleared up and completely new information has been revealed. Now we know much more about what to expect from The Rise of Azshara. It’s really nice to finally get an update on all the information we got at Blizzcon in November 2018. The announcement of the biggest patch in World of Warcraft history definitely created a lot of buzz. At the same time, the sneak peeks of the new locations and vague mentions of some other changes, gave us a lot to be excited about. Blizzard left us hanging for a few long months, but we finally got something more substantial. The 8.2 story begins with Sylvanas taking her Horde fleet and sailing onto The Great Sea. That leads to Alliance following them, with their own ships, under the leadership of Jaina Proudmoore. Then, in the middle of the sea a rift opens and swallows the fleets of both factions. The ships are destroyed by the fall and we find ourselves is Nazjatar – the formerly underwater city. Freshly revealed information includes the way of power progression in Nazjatar. To be able to survive and stand a chance against Queen Azshara, we’re going to need some help from Combat Allies. At the beginning, the players will have to hide from her Naga army and get stronger before the confrontation. During the initial crash a lot of people died or got injured, so we need to find someone that will aid us in our fight against Azshara. We already knew that there will be separate Combat Allies for both factions. During the preview stream Blizzard explained the mechanics behind that system. Every player will be able to pick one of the three Combat Allies to join them in Nazjatar. Those NPC friends will level up, gain new abilities and even unlock some cosmetics for us. They progress by killing rare spawns, completing World Quests, they even have their own Daily Quests! Each one of the Combat Allies can advance up to level 30, so there’s a lot to do with them. All the World Quests in Nazjatar will be heavily connected to Azshara and her Naga army or the ruins of ancient Night Elven city Zin’Azshari. Somewhere in those ruins, we’re going to find Javelins of Suramar – a powerful artifact necessary to defeat the Naga queen. The main storyline in Nazjatar consists of building up our strength, finding Azshara’s weaknesses and finally facing her in combat. 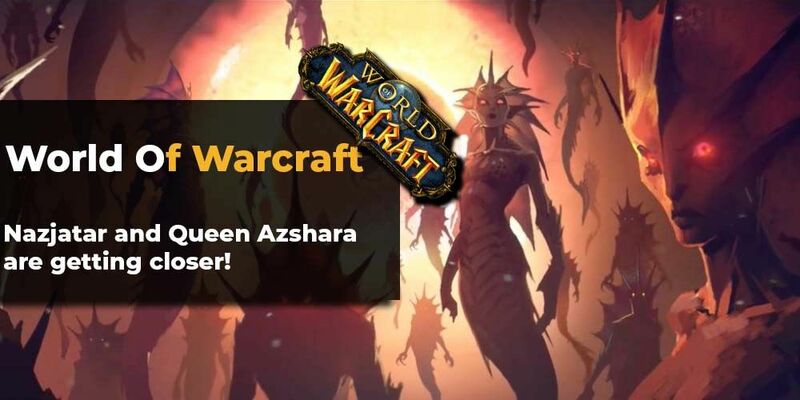 We already knew that the new raid – Azshara’s Eternal Palace, will have eight boss fights, but now we also know the bosses’ names. Mechagon is the second major zone added in patch 8.2 and in the preview stream Blizzard told us a lot about it too. The hi-tech gnome city inside a vault will offer a lot of exploration, a megadungeon and some interesting mechanics. It’s important to note that both the raid and the dungeon won’t be available on release of the patch. They will unlock two or three weeks after The Rise of Azshara. We’re going to team up with the Junker Gnomes of Rustbolt, who are forming a resistance against the King Mechagon, who wants to transform all Gnomes into robots. We will help in rebuilding Rustbolt and the Mechagon Island. There will be numerous construction projects sprinkled across the whole zone. Finishing them impacts the zone one way or the other. Some of those projects are actually turrets or fortifications that will later help us with fighting the enemies. At the same time, Mechagon will have a visitor system. Everyday three new guests will arrive in the zone. Each of them will influence the spawns and bring daily quests. Completing them will provide with some interesting rewards as well as the Mechagon reputation. Blizzard also showed us Pascal the Robot. While adventuring in Mechagon we will be able to gather schematics and materials. It will allow us to build up Pascal. He will later help us with constructing numerous different things, such as a Mechanocat Mount. Furthermore, in Mechagon you will be able to build yourself a Spiderbot Mount! The devs also said that, there are many secrets to discover in Mechagon and to find every one of them we’re going to have to spend a long time in this zone. The new dungeon includes one more unique feature. A trinket called Pocket Sized Computional Device. It has three sockets: red, blue and yellow. You can install Punch Cards into them, to get some bonus effects. Yellow ones give you flat stats, the reds grant on-hit or on-use effects and blue cards provide some unique utility capacities. Both Nazjatar and Mechagon will also implement a rare spawn system, similar to the one known from Timeless Isle. Make sure to follow the stars on your minimap, because the rare spawns will have a chance to drop really valuable loot. Finally, let’s talk about the biggest mechanical change in 8.2, the Heart of Azeroth rework. This is probably the most interesting part, since all we knew earlier was that Blizzard is looking at it, but they didn't say anything about what their ideas were. It will also impact the whole gameplay the most. In the upcoming update, we will have the opportunity to rebuild The Chamber of Heart and create a new construction – The Heart Forge. It will allow us to insert essences into our Heart of Azeroth. When you unlock all the sockets, you will have access to one major and two minor slots. The major socket allows you to use the Essence’s major power which is an active ability, as well as its minor, passive power. The minor slots will only grant you the passive abilities. Some of the essences require a certain specialization and have great synergies with their kits. The Essences come in four different ranks. The higher ones can not only increase the amounts of damage, or potency of the effects, but can also bring some extra utility or new mechanics. 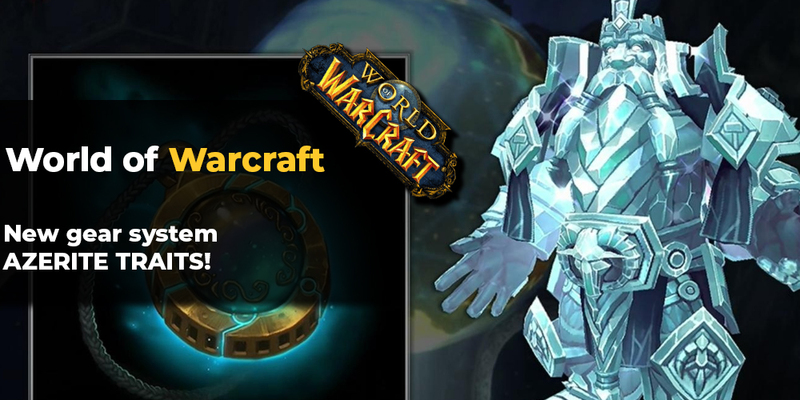 We feel that getting the best Essences as soon as possible, will be an important objective for many WoW players. The highest rank is called legendary and it provides the user with a special visual effect while using the active ability. To collect every Essence available, we’re going to have to engage in all kinds of activities. You can get them by raiding, doing dungeons, completing quests, getting reputation, fighting in PvP and more. Back in November, Blizzard announced the introduction of Heroic Warfronts. Now they revealed that the first one of them will be called Battle of Stromgarde. The Heroic Warfronts are going to be much more focused on the strategic aspect of the game as the players will have to manage their forces to defend multiple chokepoints at the same time. As for PvP, Blizzard cooked up two new exciting features. First one being a Mechagon-themed arena called The Robodrome. 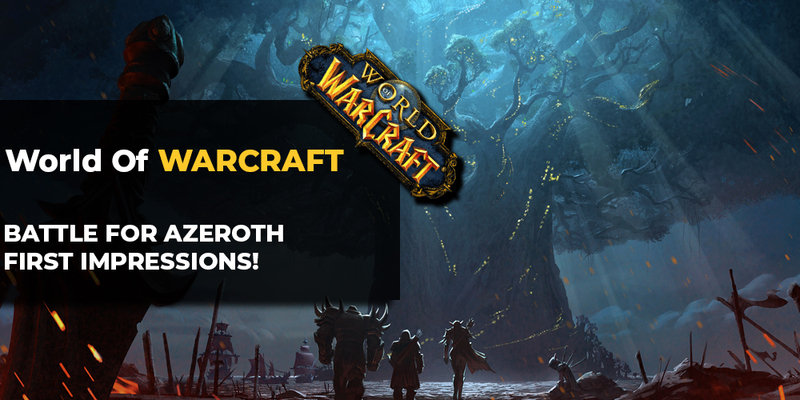 The other one is the addition of an Epic Battleground – Ashran. Patch 8.2 will also bring something that was kept a secret until the preview stream. We’re talking about the Mount Equipment. This feature will allow us for a lot of more freedom while choosing a mount for different locations. We will be able to unlock water walking or give ourselves an emergency parachute on every mount. Blizzard also previewed some more collectable content, such as Mechano-Wheel Mount, Snap Dragon Mount known from Warcraft 3 and some new battle pets. Along the already announced progressing storyline of Sylvanas, Varok, Jaina and Anduin we will also follow the War Campaign with the story of Baine Bloodhoof – the Tauren chieftain who’s currently imprisoned beneath Orgimmar. 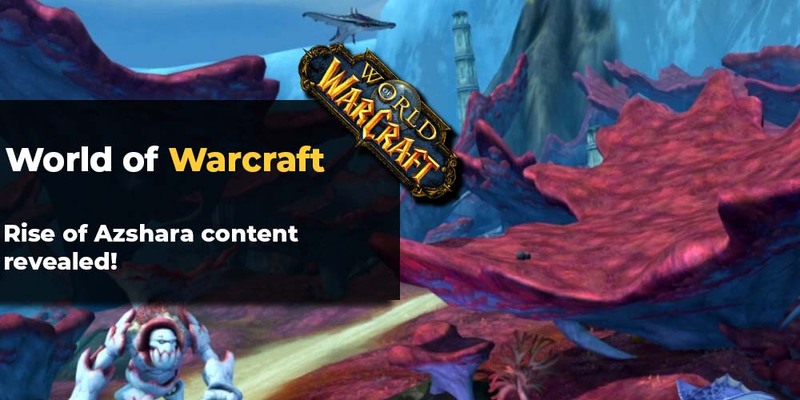 At the same time, the stream confirmed the content that was announced earlier, such as two new islands: Crestfall and Snowblossom Village, the Heritage Armors for Gnomes and Tauren and of course Battle of Azeroth season 3, along some other minor changes. While most of the online WoW community seems happy about the new locations and collectable content, there’s some controversy around the Heart of Azeroth changes. The majority believes that they’re a step in the right direction from the current system, but at the same time, many players find them rather underwhelming, especially for such a big patch. 8.2 is coming closer and that’s all there is to know about it at the moment. Developers weren’t lying when they said it’s a really big patch. We’re going to get a lot of content to play with and it looks really promising. Rise of Azshara might be a good time to come back to the world’s biggest MMORPG.